Tuskegee Airman, civil rights activist, and attorney Luther A. Goodwin was born April 17, 1920 in Jacksonville, Florida, the son of Hilliard E. Goodwin, a college instructor and building contractor, and Helen H. Goodwin. His family moved to Bakersfield, California, where he attended elementary and high school. He attended Bakersfield Junior College prior to transferring to the University of California at Los Angeles where he had the good fortune to befriend future politician George E. Brown, Jr. when they became the university’s first black-white dormitory roommate pairing. An athletic student, Goodwin was on the track team and was a friend of the legendary Jackie Robinson who was on the basketball, baseball, track, and football teams. In 1944 Goodwin married fellow student Joye Speights who he had been infatuated with since childhood. But World War II interrupted Goodwin’s studies at UCLA. In September 8, 1944 he completed flight training school at Tuskegee, Alabama, and began flying bombers in the Army Air Corps. A year later he survived a crash landing at Goodman Field, Kentucky. In the post-war era he piloted both propeller and jet aircraft for the military until his return to the classroom at the University of California at Berkeley in 1954. Upon earning his degree in accounting he pursued a law degree at the University of California’s Hastings College of Law. After passing the bar exam in 1957 he was hired as San Francisco’s second black Deputy District Attorney General. Goodwin’s career as deputy DA ended abruptly when in 1964, contrary to the wishes of city administrators, he and his wife, a nurse and civil rights activist, took part in an anti-racism demonstration in the city in which hundreds were arrested. He and Joye relocated to El Cajon, California, a suburb of San Diego. In 1966 Goodwin partnered with former Little Rock, Arkansas NAACP president Thaddeus Williams to launch the law firm of Williams and Goodwin, specializing in criminal and civil litigation. His most publicized case was People v. Jordan in which he successfully defended militant student Fania Davis Jordan, the sister of widely known political activist Angela Davis, when she and her husband traded gunfire with sheriff’s deputies on a road in Del Mar, California. A civil libertarian, Goodwin was a founding member of the San Diego ACLU; and he was a board member of region’s Family Service Association of America, a social welfare group. Following the death of Thaddeus Williams, Goodwin established the law firm of Goodwin & Fisher which dissolved shortly after his son, Ralph, made national headlines for participating in the hijacking of a TWA plane to Cuba in 1971. 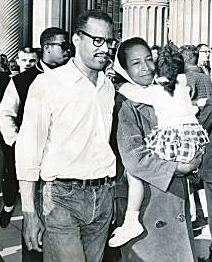 The incident persuaded Luther and Joye to leave the country for Africa with their two daughters. For nearly a year they lived in Tanzania where Luther was appointed to head the underdeveloped nation’s department of natural resources. Then, in quick succession, more life altering tragedies struck: Goodwin went blind while in Tanzania; Ralph drowned in Cuba; and daughter Victoria died of cancer. The family returned to the United States and for awhile and mainly depended on Joye for income. Goodwin found work as a legal advisor and worked closely with his old UCLA roommate and long-time family friend, liberal Democratic Congressman George Brown Jr., managing his district offices in San Bernardino and Riverside. After six years employed by Brown, Goodwin returned to San Diego in 1979. He died there on January 5, 1982, survived by his wife and daughter, Hope Goodwin. Robert Fikes, Jr., “The Incomparable Mr. Goodwin” (unpublished paper); Luther Goodwin obituary in The San Bernardino County Sun (January 7, 1982); “Angela Davis Kin Jailed in Shooting,” San Diego Union (November 19, 1969).